Onions seem to do well in my garden. They like me. It's a no fail crop for us. We grow 3 types of onions, yellow, white and red. 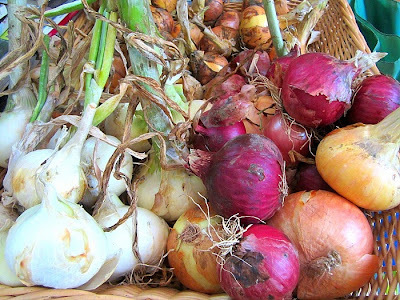 Besides make onion jam, what am I going to do with all these onions? 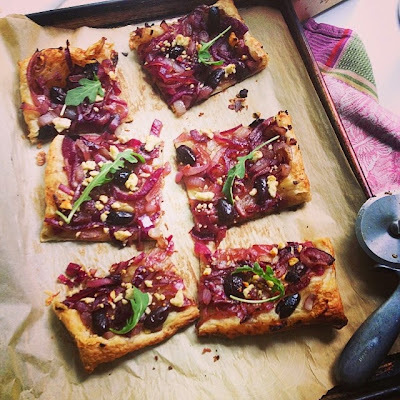 Well, I made a red onion tart with the surplus and I highly recommend you make this too. It's so easy, with just 4 ingredients......frozen puff pastry, red onions, olives and feta cheese. This is a great weeknight dinner with a salad, or a special appetizer for a party. In a medium, heavy skillet, heat the oil and butter and cook the red onions slices for about 10 minutes on low heat. After 10 minutes, add in the sugar and balsamic vinegar. Cook another 5 minutes, the mixture will be nice and syrupy. Add in a pinch of kosher salt while cooking. Let mixture cool. Roll out the puff pastry and lay it on a baking sheet lined w/ parchment paper. 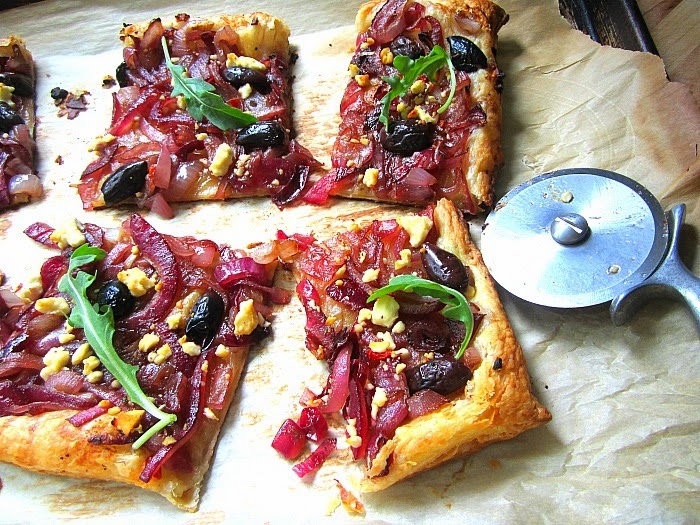 Spread the cooled caramelized onions over the puff pastry evenly. 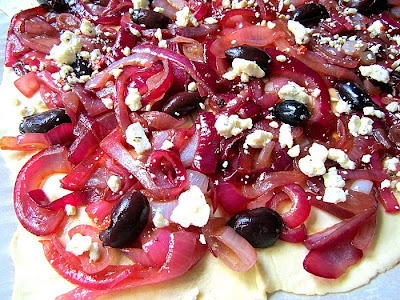 Dot with olives and sprinkle with feta cheese. Cut into squares and serve w/ some arugula on top. That looks very good! A must try!! It kind of reminds me of the friday night pizza! which I loved!! Luckily I have a surplus of onions. These are very delicious. 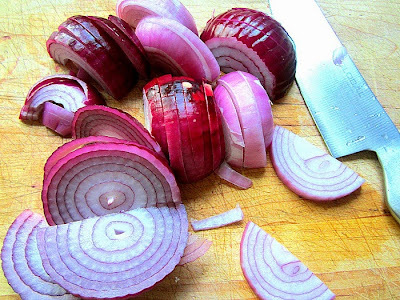 These red onions are perfect for snack as well. 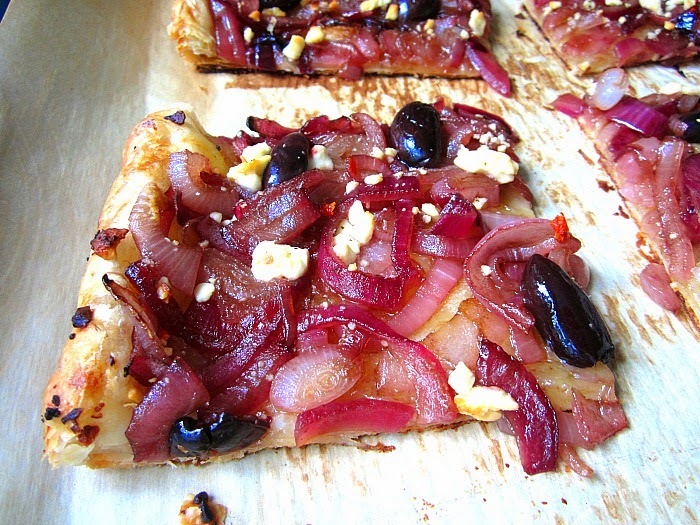 Those red onions look like the wonderful ones that I look for - not the big harsh ones. Now I wish I had planted onions. Next year. This looks amazing. Do you mean demerara sugar, which is rather grainy, and not muscovado which is clumped together?